“Pinochet and the Letelier-Moffitt Murders: Implications for US Policy,” SECRET, Memorandum for the President, October 6, 1987. When the U.S. Secretary of State John Kerry met with President Bachelet on Monday, October 5, he engaged in an important act of what I call “declassified diplomacy.” He gave her a pen drive on which was stored 1000 pages of once TOP SECRET U.S. national security documents relating to Pinochet’s role in an act of terrorism in the capital city of the United States—the 1976 assassination by car bomb of Orlando Letelier and his colleague, Ronni Karpen Moffitt. In a rather extraordinary act of diplomatic collaboration both the Chilean foreign ministry and the U.S. Department of State are posting them on their websites for all U.S. and Chilean citizens, and indeed the entire world community, to read and evaluate. 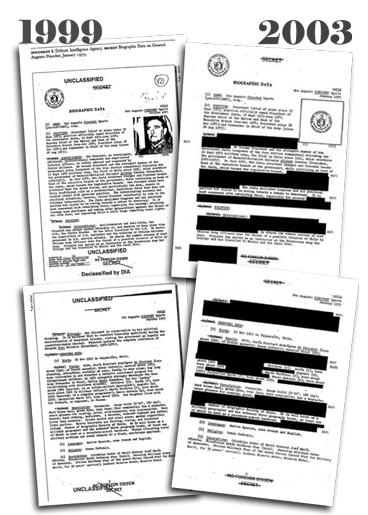 These records are among the most sensitive and secret in the holdings of the CIA, FBI, Defense and State Departments, because they shed light on the worst pre-9/11 act of international terrorism in Washington D.C. Had these documents been declassified at the time they were written in the aftermath of the car-bombing, they might have resulted in the indictment of the dictator himself. The Defense Intelligence Agency biographic documents on General Augusto Pinochet, censored different ways by different declassification officers. Pinochet managed to escape legal accountability as an international terrorist. But almost 40 years after that heinous crime, this form of documentary evidence remains vital for the verdict of history on his role. 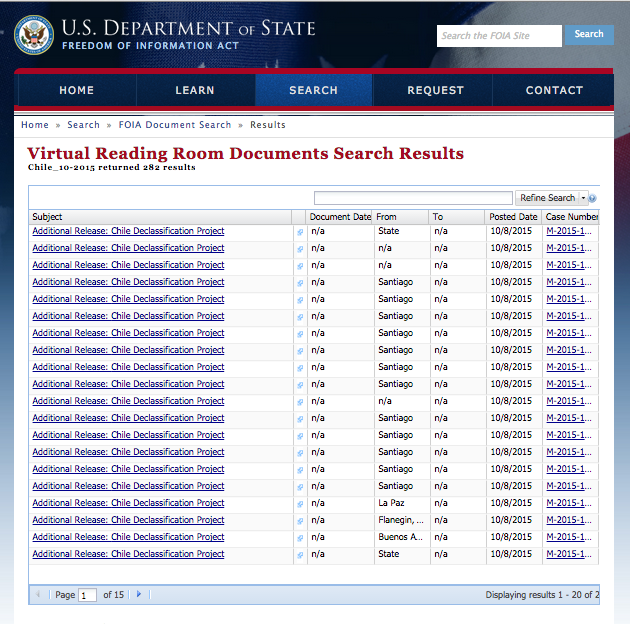 The newly-released documents can be found here. The genesis of this unique collection dates back to the time of General Pinochet’s arrest in London in 1998, when the families and key agencies in Washington, including the Institute for Policy Studies where Letelier and Moffitt worked and my organization–the National Security Archive–pressed the Clinton Administration to re-open a formal investigation into Pinochet’s personal role in the car-bombing assassination of Orlando Letelier and Ronni Karpen Moffitt, and his efforts to hide his regime’s culpability. Our argument to the Clinton White House was that the United States had stronger legal reason to prosecute Pinochet than did Spain, and that he should be extradited to Washington to stand trial for the murders of Letelier and Moffitt. U.S. Attorney General Janet Reno actually approved an FBI/Justice Department inquiry; indeed, in April/May 2000 a team of U.S. government investigators were in Santiago working with the Chilean PDI on this case. They eventually concluded, in a still secret report, that Pinochet should be indicted. But by that time, Clinton had come to the end of his tenure and George W. Bush had been elected. 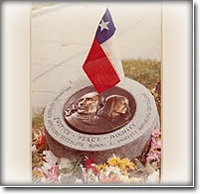 The Bush administration refused to pursue the prosecution of Pinochet, even after a major terrorist attack on September 11, 2001, made the fight against terrorism the President’s number one priority. The investigation into Pinochet’s role had one unforeseen consequence: it resulted in important documents being withheld from the Clinton Administration’s special declassification project on Chile. That project resulted in the centralization, review, and declassification of 23,000 CIA, State Department, Defense Department, White House and FBI records. Among those documents were hundreds of records implicating Pinochet personally in the Letelier-Moffitt assassinations. But instead of being released along with the thousands of other records, these documents were withheld as potential evidence for the investigation. For the sake of truth and justice, these 250 documents tying Pinochet to an act of international terrorism in Washington D.C. were among the most important in the secret archives of the United States. 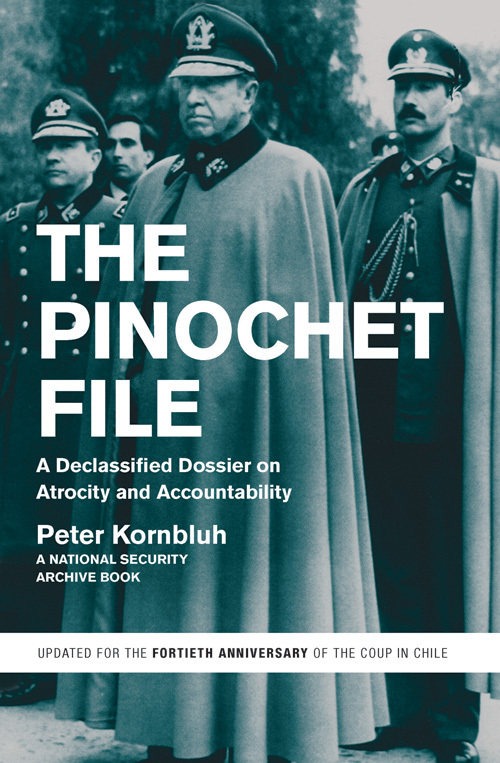 After Pinochet died, my organization, the National Security Archive, attempted to obtain the declassification of these records, without success. It has taken until now for all the stars to align to make this important declassification possible. With the reelection of Michelle Bachelet, Chile had key diplomats, among them Canciller Heraldo Munoz, and Ambassador Juan Gabriel Valdes (who was working with Orlando Letelier in Washington D.C. at the time of his assassination) who had a personal commitment to this advancing the cause of justice in this atrocity. Inside the Obama administration were key policy makers who understood the value of “declassified diplomacy”—for the families of the victims, for the appropriate use of U.S. documentation to advance the cause of human rights, and for the simple sake of history. They proved to be very receptive to a formal initiative earlier this year (with the strategic support of the National Security Archive) to obtain this documentation. Secretary Kerry’s trip to Santiago this week provided an opportunity to turn over the records that have been recovered so far to the Chilean government and make them public. By Peter Kornbluh, The New Press, Updated edition (September 11, 2013). More documents relating to Augusto Pinochet that will be made available to Chile in the near future. Moreover, this positive and successful effort at “declassified diplomacy” also creates a useful and important precedent for the future release of still-secret U.S. documents relating to cases that remain judicially unresolved: among them the case of disappeared U.S. citizen Boris Weisfeiler, the death of former president Eduardo Frei, as well as the origins and activities of Operation Condor which facilitated the assassination of Orlando Letelier and Ronni Moffitt. Pinochet will never stand trial for this atrocity and the thousands of others he committed. But this special declassification on the Letelier-Moffitt case dramatically demonstrates how important U.S. government documents can be—in the court of history where the ultimate public verdict can be rendered.